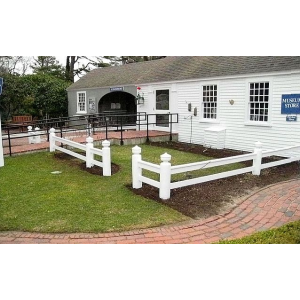 We designed, installed, and maintain this English Cottage Garden and walkway which honors Je Je Pierce, a long time beloved Trustee of Heritage Museums and Gardens. 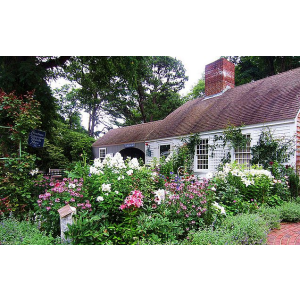 This garden invites you to stroll the path stepping into a romantic era of Old England, filled with the allure of rich wonderful scents from flowers brimming over on all sides. With its exquisite beauty it is designed to awaken your senses from Spring until frost and celebrate Je Je’s favorite color, pink! 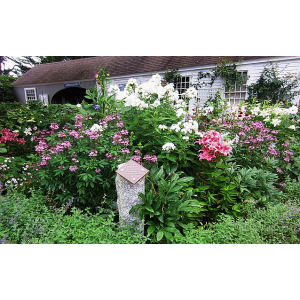 It features some of her favorite roses including the Gertrude Jekyll Rose, Dianna Princess of Wales, Climbing Eden, The Mary Rose, and Abraham Darby. The Dwarf Boxwood, Sky Pencil Holly, English Armillary and hand cut stone path provide structure and winter interest in the garden. Many impressionist paintings portray the beauty of the cottage garden, with Monet’s being the most famous. 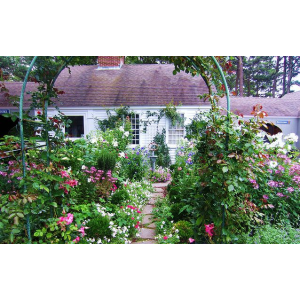 Today, an English Cottage Garden is often the landscape design style of choice for the true romantics at heart. As you walk through the Arbor, hand cut pieces of Bluestone create a timeless path. Creeping thyme is planted between the stones to offer old world charm. At the end of the path you’ll find the Greenwich Armillary mounted on a granite post. 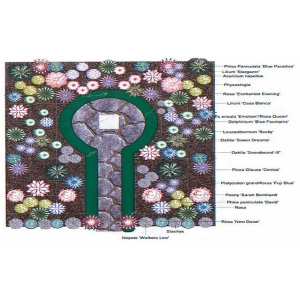 The circle of stones are tightly laid and mortared creating a formal transition to the granite post and armillary. The Armillary is reproduced from the originals found in formal English gardens. Anchored by a copper band, the brass arrow shaft tells time by casting a shadow on the Equator ring. The inner surface of the ring shows the hours of the day, and is decorated with the phases of the moon, while the exterior surface has an intricate Florentine design. The Armillary base is inscribed with the signs of the Zodiac around a sunburst medallion. The base supports two angels, who in turn support the Meridian ring. 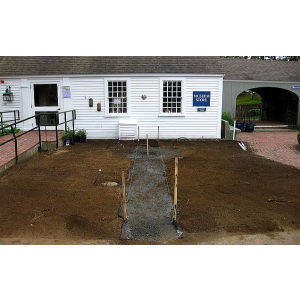 In 2009, Heritage chose Maria Hickey and Associates to design an English Cottage Garden in front of the Museum Store. This garden has grown to become a “must see” as visitors enter the grounds. Visitors are always seen photographing the ever changing display of cottage garden flowers during the seasons. This garden is an inspiration for both garden lovers and those who just enjoy the beauty of looking.